At our CAH event on December 5, the "Humanist Creation Story" was presented. It tells the story from the Big Bang to our Concord Area Humanists. It was so well received that we would like to share it with others. So, the slides used for the talk are attached as a 19-page PDF file. Please feel free to share it with others (maybe a Christmas present?). Another reason for sharing it is that our next meeting, on January 9, will be a sequel to the December 5 one. The attached slides will, to some extent, be an introduction for that next meeting. 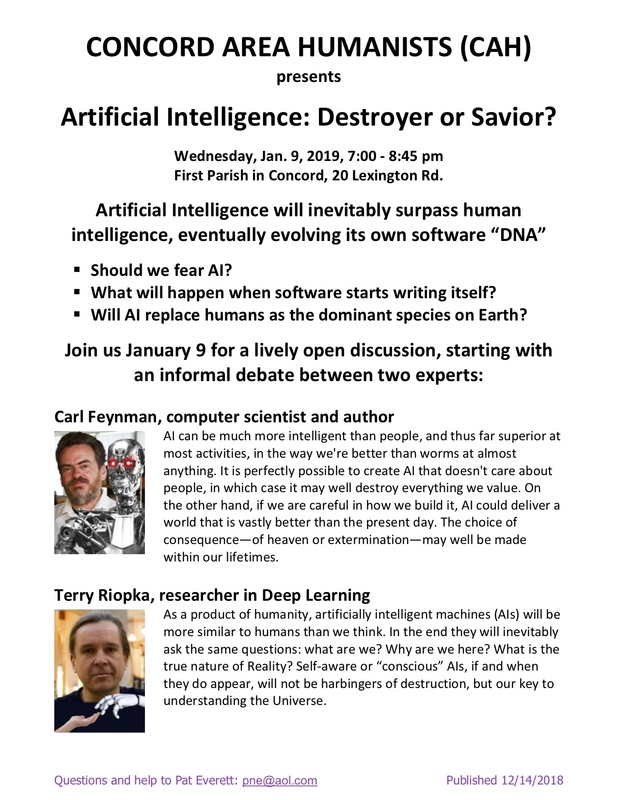 The flier for that Jan. 9 meeting is imaged below. Franklin Davis, a relatively new member of our Steering Committee, is managing the Jan.9 meeting. It will explore the suggestion made by Harari that, sometime in the future, Artificial Intelligence may replace us as the Dominant Species. Two experts in the field will introduce the topic, give their varying views, and then the discussion will start. Do come and either join the active discussion, or come and learn from it, or do both. An easily printable pdf version of the flier is attached. You are encouraged to display it and to forward this email to your friends. Looking forward to seeing you at this New Year's meeting. and hoping to see you (again?) at one of our CAH meetings. Patrick Everett is one of the founders of Concord Area Humanists and president of the steering committee. He is a retired engineer/scientist and a long-term member of First Parish in Concord. Pat and his wife live in Concord. Enter the characters shown in the image. Reload the page to show a different image.